Today: Alice Medrich's famous brownies are made in an 8-inch pan, but you'll want to make a sheet pan-worth. Here's how you can make that happen with just a little math. 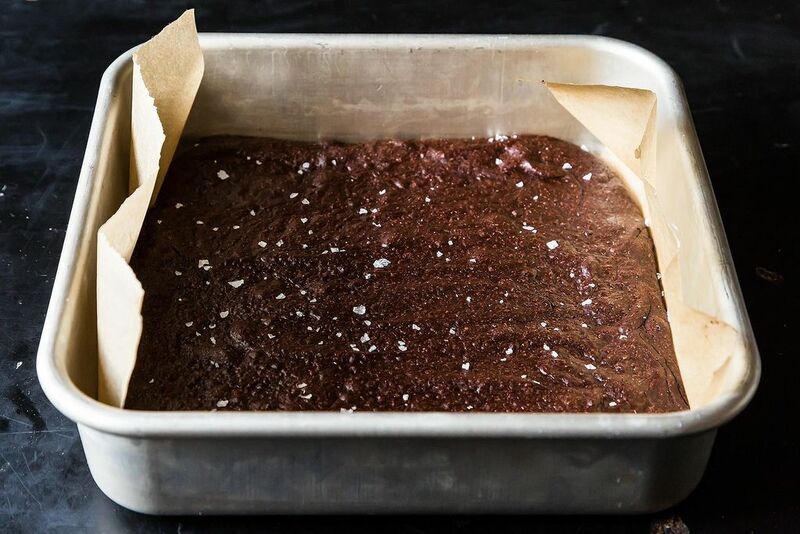 The brownie recipe you want to make calls for an 8-inch square pan, but your only square pan is a 9-inch. Should you risk it? Maybe you want to double or triple a recipe but you aren’t sure which pan to use, or maybe you have a specific large pan but don’t know how many times to multiply your recipe in order to fill it. The answers to these and similar questions (asked endlessly in cooking classes!) do not involve rocket science, but just enough elementary school math to calculate the area of a square, rectangle, or circle. I love the math (and I’ve included a little math review below if you want to brush up), but I’m sharing my chart in case you don’t have my thing for math. The handy list below (or some basic math, also explained below) will tell you the surface area of your pan. Once you know the area of any pan, you can compare it to the area of another pan to see how much bigger or smaller it is. You can divide the area of a large pan by the area of a small pan to figure out how many times to multiply a recipe to fill the larger pan with the same depth of batter (more on that later). I don’t always have the chart at hand; I often just do the math! Just by glancing at the two pans, you might think that a 9-inch pan is very close in size to an 8-inch pan of the same shape, thus making it a reasonable substitute. But if you check the chart, you’ll find that a 9-inch square pan is more than 25% larger than an 8-inch square pan. (The relationship between a 9-inch and 8-inch round pan is similar.) Such a considerable difference will result in a 9-inch batch of very thin brownies that may be over-baked by the time you check them for doneness (because thin brownies bake faster than thick ones). Knowing this beforehand, you can increase the recipe by 25% for results as thick than the original recipe intended. If you want brownies that are even a tad thicker than the original recipe, you can even increase the recipe by 33%. Let's try an example: How many times should you multiply an 8-inch brownie recipe to fill a 9- x 13-inch pan or a 12- x 16-inch half sheet? To figure this out, divide the area of the larger pan by the area of the 8-inch pan. For the 9- x 13-inch pan: 117 divided by 64 = 1.82, which is close enough to 2 that you can confidently double the recipe for the larger pan. For the half sheet: 192 divided by 64 is exactly 3, so you can multiply the recipe times 3. Using similar math, you can calculate how many times to multiply the recipe for a round cake to make a large rectangular sheet cake. And don’t forget that you don’t always have to multiply recipes by whole numbers—it’s perfectly fine to multiply a recipe by 1 1/2 or 2 2/3. About now, you might be wondering about eggs. It’s nice if you can increase recipes so that you don’t have to deal with fractions of eggs—by increasing a 2-egg batter by 1 1/2 or a 3-egg batter by 1/3 or 2/3, for example—but it is not essential. Here’s what to do if you multiply a recipe and end up needing part of an egg: Set aside any whole eggs you need. Next, whisk the other egg to blend the white and yolk; weigh it (preferably in grams); then weigh out the fraction of the egg that you need for the recipe and add that to the whole eggs. If you need 40% of a 50-gram egg, that’s 20 grams of the whisked egg. When egg whites and yolks are used separately, weigh and measure them in the same way, but separately. Add leftover egg parts to your morning scramble. See, no waste and still no rocket science! The chart (or your ability to do the math) is extremely valuable: Use it but don’t be a slave to it. When I make brownies in a large quantity, I like them to be about the same thickness as they are in a small batch, so I stay close to the chart. But, when I increase the dimensions of a birthday cake, I often make it a bit taller than the original (in other words, I round up when multiplying) because the proportions are visually more pleasing. For example, if I am making a 12-inch round cake using a recipe meant for an 8-inch pan, I divide the area of the 12-inch round pan (113) by the area of the 8-inch round (50 inches) and get 2.26. But instead of multiplying the recipe by just 2.26, I might multiply it by 3 so that the cake will turn out tall and lofty. See: Love the chart, but don’t let it bully you! When you round things up like that, don’t go overboard: Pans should not be filled more than about 2/3 full or batter may overflow. If you do end up with too much batter, scrape the excess into cupcake molds or a mini cake pan—bonus cakes never go uneaten! 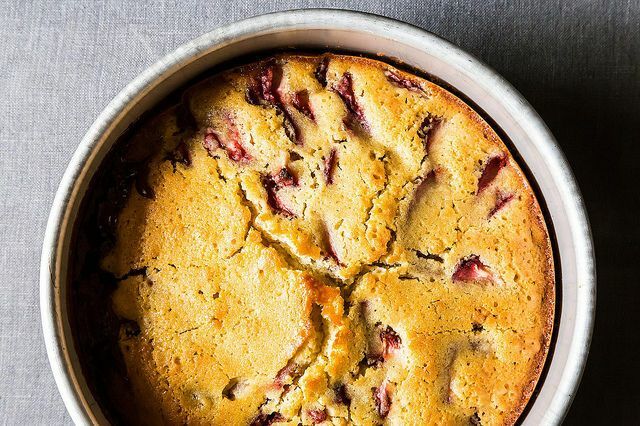 When you increase recipes and bake in larger pans, you should anticipate longer baking—anywhere from a little longer if the pans are filled to the same level as the original recipe to considerably longer if you are making the cake taller by filling the pan a bit more. If you are making a smaller amount of the recipe, check earlier than you think you need. And always use a cake tester to check to see if the cake is finished. 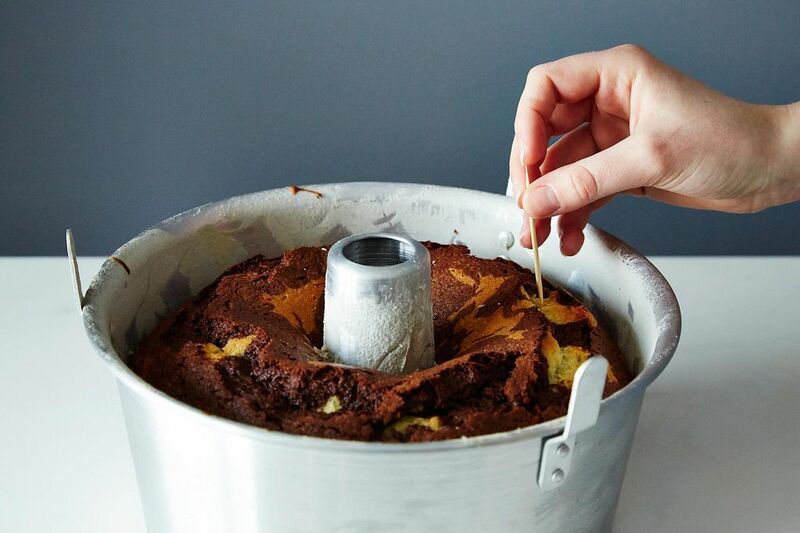 Our household is down to two and I plan to start baking deserts in a six-inch round cake pan. I have a good sense from this article about how to cut down the ingredients. Is there a general rule of thumb about how to translate cooking times (many recipes call for an 8 or 9 inch round cake pan, same depth). Apologies if I have missed that herein! What if you wanted to do the opposite? Such as scaling down a recipe. I want to take my cake recipe, that calls for a 9 inch round and make 6 inch rounds with it...not sure how to cut the recipe in halve correctly? Thanks for any help! How do I calculate from 8 round to cupcakes? Would the area math work for cupcakes and if so, is their a standard size for a cupcake? I'm baking brownies and the recipe calls for an 8x8 pan but i want to bake it in a 9x9 pan. I followed your computation and end up to 1.50. How can i double my recipe? I want to halve a recipe that calls for a 9 inch springform pan. What size pan should I use instead? To fill the pan to the same depth, you'll want to use a pan that's 6.3” in diameter (or as close as you can get) - that's 9” divided by the square root of 2 (0.707). I’m making cornbread and have a 9” square pan, not the 8” a square pan called for in the recipe. How do I adjust the cooking time? I am making a Strawberry dessert with pretzel crust that requires a 9 by 13 pan. I would like to make one and a half times that amount do not want to completely double the recipe what size pan would I use? many possibilities. 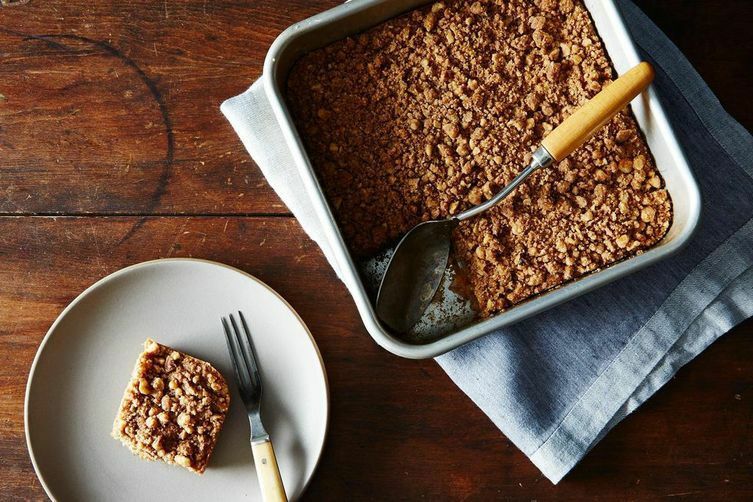 how about a 13" x 13" square pan. that will be close to your 1 1/2 times amount. Im making a 1/8 in cake, what size cake pan do I use? what do you mean by 1/8 in? do you really mean it's 1/8 inch thick? you don't say what size baking you want to use. assuming it's a standard size, say 9" x 13", then you'll need about 2/3 (actually about 62.5%) of your current recipe. please help me. I have a TBI but, want to make a recipe for spice bars which uses a 17x111x1-1/2 inch pan that is measured from the inside. I don't have this size pan so what can I substitute? Cab somebody help? Very useful article for increasing the volume of cake and what pan size to use. For example an 8 x 2” pan using 6 eggs And 2 cups almond flour. To halve the recipe what pan size will work best? So I have a chocolate cake recipe that makes 3 8" rounds. I want to make a rectangle cake and I have a 9x13 pan. So would 1 batch of cake be enough? If I split it between two 9x13 pans, I'd have thinner layers to stack? Hi! I am hoping you can help me! I have a carrot cake receipt that calls for 2 9 inch round pans. I am trying to convert it to a 3 tier cake. Pan sizes: 3x2, 5x2, 7x2. How do I convert that? Thank you! Hello, Just to make sure I get this right...if I have a recipe for an 8 or 9 inch cheesecake...what do I do if I want to use a 6 inch pan? Thanks! Hi, my query is about baking in 3in deep pans. A couple of sites suggest x number of cups per pan using a 3in deep pan but the volumes differ significantly. Do you have a suggestion on the volume required for a 6x3in, 8x3in and 10x3in deep pan? I want to avoid underfilling as I've read this inhibits rising and overfilling where the cake dries out from taking too long to set or doesn't set snd sinks in the middle. Thanks for replying. I have a favorite chocolate cake that uses 2, 8 inch pans and other cakes that use 9 inch pans. My 6 inch pan is round and 2 1/2 inches deep. Very sorry about the loss of your husband. However, you haven't provided enough info to answer your question. Do you have a current recipe you'd like to reduce? What type and size pan is it he current recipe? Is the new 6” pan circular, square , or ?? Etc. Just need conversion from large egg white amounts to 7 JUMBO egg whites.